Take down your tech rivals (or good friends) with sumo wrestling at the GeekWire Bash! Image courtesy of GeekWire. 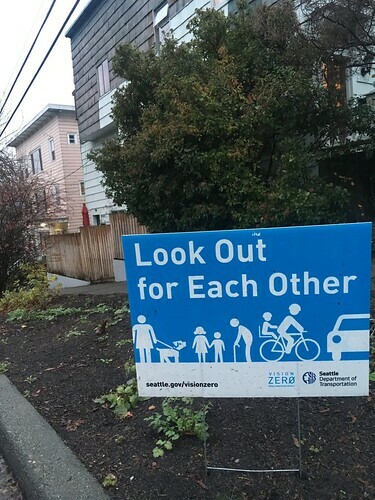 Here’s a snapshot of this week’s events moving Seattle that may affect how you get around. Plan your trip! See our trip planning tools section of this post. 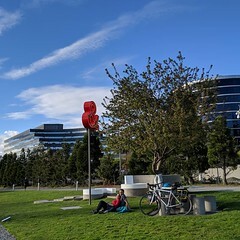 GeekWire Bash 2019: The annual GeekWire Bash features virtual reality, video games, robotics, epic dodgeball, foosball, ping pong, and Catan tournaments. At CenturyLink Field Event Center. Event hours: 3 – 9PM. Estimated attendance: 2,000. Seattle Baseball Showcase: At T-Mobile Park. The three-day, round-robin tournament pairs West Coast schools with national collegiate teams, each playing one game per day. Games are scheduled for 11:00 AM, 3:00 PM, and 7:00 PM daily. Estimated attendance: 2,000. Seattle Kennel Club Show: At CenturyLink Field Event Center. Event hours: 8AM – 5PM. Estimated attendance: 5,000. 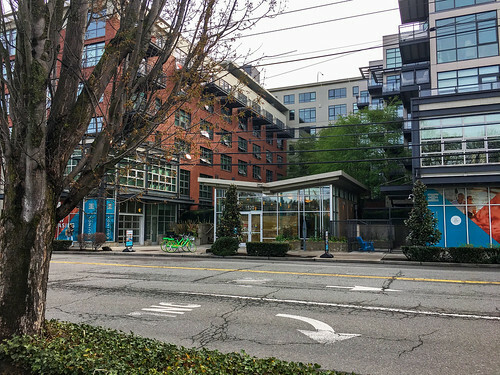 SODO Flea: Monthly neighborhood flea market. The event will close Utah Ave. S. between S. Stacy St. and S. Holgate St. Event hours: 10AM – 4PM. Estimated attendance: 1,000. 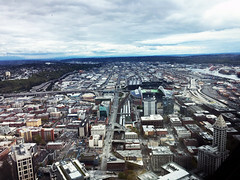 Seattle Sounders vs. Colorado Rockies: At CenturyLink Field. Kickoff: 7PM. Estimated attendance: 35,000. LLS Firefighter Climb: The world’s largest on-air stair climb competition. 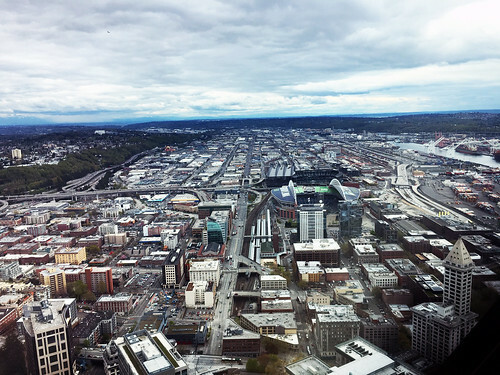 Open only to career or volunteer firefighters, this event features over 2,000 members of the fire service who must register, commit to raising a minimum amount for the Leukemia & Lymphoma Society, and then ascend the tallest building in Seattle on event day. The entirety of the course must be completed while wearing full turnout gear, while on-air. Event hours: 7AM – 5PM. Estimated attendance: 2,500. We’re extending the 5th Ave bus lane north to connect more bus riders to I-5 after buses come out of the Downtown Seattle Transit Tunnel. New bus lane in downtown Seattle will help keep transit moving during the next chapter of the #SeattleSqueeze. We made it through the longest highway closure in the Puget Sound Region! But the Seattle Squeeze is far from over. 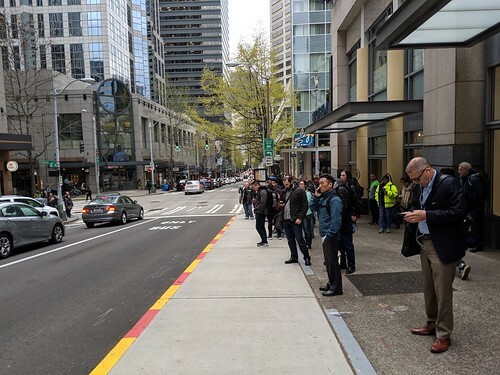 Our next chapter of the Seattle Squeeze begins on March 23, 2019, when all buses that use the Downtown Seattle Transit Tunnel will be permanently relocated to surface streets. 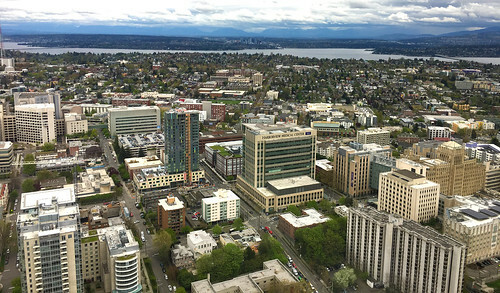 This change is being made to accommodate the Washington State Convention Center construction and future Link light rail expansion to the Eastside in 2023. In all, 15 bus routes will be changing what bus stops they serve. Additionally, all-door boarding will launch on 3rd Avenue, with 21 of 30 locations active starting March 23. More buses on the street: About 800 more buses will travel daily on downtown streets. During the rush hour, there will be about 70 more buses on the street. More people getting on and off their bus on downtown sidewalks: This change affects about 37,600 daily riders, including the 11,000 people who catch their bus downtown during the evening rush hour. 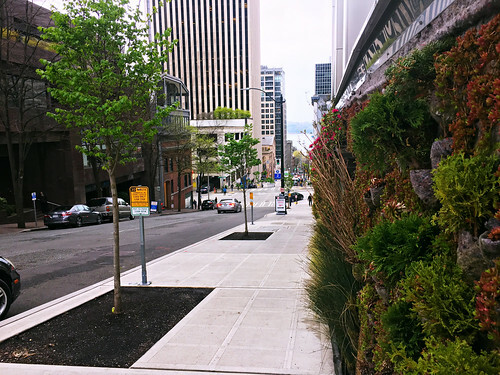 To keep buses and riders moving, the City of Seattle is building a new transit pathway on 5th Ave and 6th Ave.
To keep people moving efficiently through downtown, we’re creating a new northbound transit pathway on 5th Ave and 6th Ave in downtown Seattle. 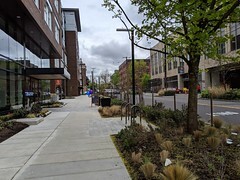 The existing, northbound transit lane on 5th Ave will be extended 2 blocks to Marion St, where it will connect to 6th Ave and continue north to Olive Way. Project map with new transit pathway and bus information. 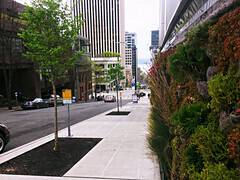 Installation of the 5th/6th Transit Pathway began this week with signal work on 5th Ave in downtown Seattle. You’ll start noticing bigger changes to the street layout this weekend. 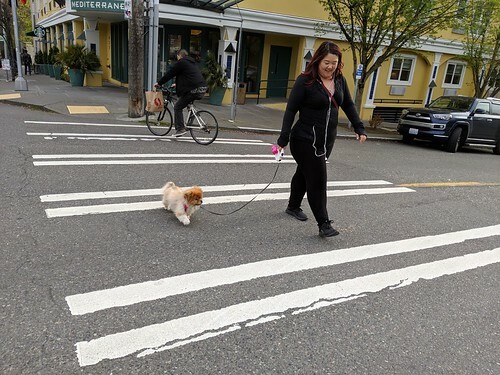 Starting Saturday, March 2, we will remove existing street markings and lane stripes by “hydroblasting,” which can be loud, and then install the new lane stripes and markings. We will work on removing lane striping and adding new striping from 7 AM, Saturday, March 2, to 11 PM, Tuesday, March 5. All noisy work will be completed 9 AM – 10 PM on the weekend, and 7 AM – 10 PM on weekdays. The approved noise variance permit has been posted and we’ve spray-painted the layout on the streets and sidewalks already. This new striping will combine with new signs, new traffic signals, and new bus stops to create the 24/7 bus lane on 5th Ave and the peak-only bus lane on 6th Ave.
Get ready: 5th Ave and 6th Ave will feel different than they do today. 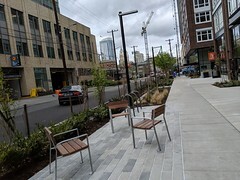 Example lane configuration along 6th Ave, between University St and Union St. There will be more buses traveling northbound, the numbers of lanes will change in some locations, and parking and loading spaces will be restricted on the west side of the street between 3-7 pm. 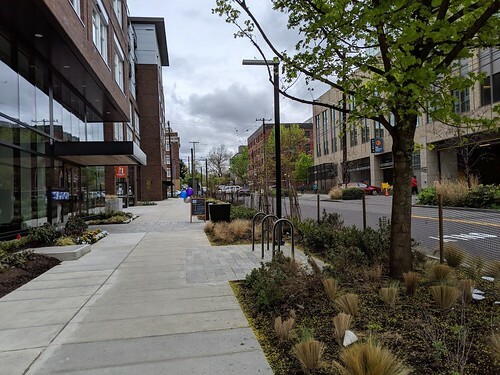 The existing parking lane on the west side, from Pine St to University St, will now be a travel lane during peak periods. Please be aware of these changes and practice patience as we all adjust to new ways of getting around downtown. Overall, 5th Ave is going to feel different. 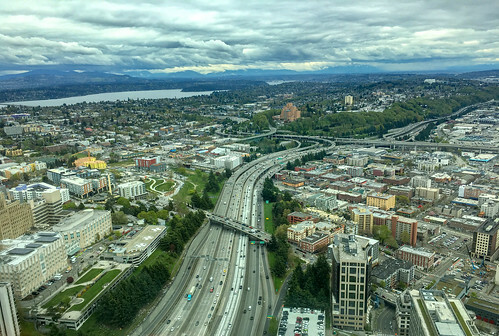 Buses will now be heading northbound towards oncoming traffic, and southbound turns into I-5 express lanes will be made from the center lane instead of the curbside lane as buses pass through the area. If you’re traveling on 5th Ave, be ready for these changes. You’re also going to see more buses on Marion St to 6th Ave. Right now, this stretch carries 10 buses per hour. After March 23, it will carry 53 buses an hour. 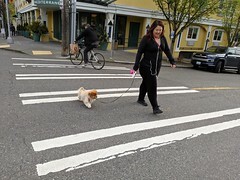 We are adding right turn signals at 6th Ave and Pike St and 6th Ave and Olive Way to help buses and vehicles making right turns off of 6th Ave, and to reduce potential conflict between people walking and people driving in the crosswalks. We are being flexible with improvements and we will continue to monitor and adjust signal timing or striping if needed. 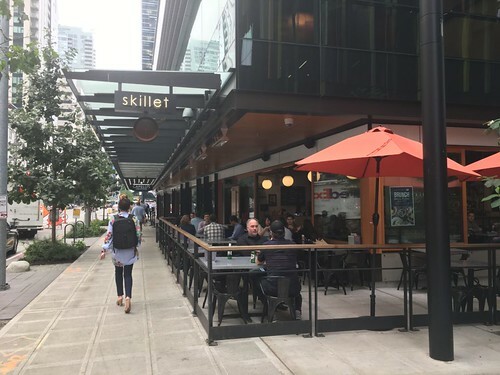 Thank you for your patience as we work to connect communities to downtown Seattle with fast, regular service and to create the public spaces our growing region needs during the #SeattleSqueeze! The demolition of the Alaskan Way Viaduct has begun. Learn about the demo plan, track the demo, & what’s next. We’re doing it, Seattle. We’re breaking records left and right. Before we get too comfy adjusting back to our pre-viaduct/pre-snowmaggedon way of travel and work, the #SeattleSqueeze is well underway and there is more coming. The SR #99Tunnel is open & the demolition of the Alaskan Way Viaduct has begun. Photo by WSDOT. Excavator with a concrete cracking attachment chews up the deck of the Alaskan Way Viaduct near the Seattle Aquarium. Turn right to access First Avenue. This video 👈👀 shows what the choices look like. Also, visit King County Metro’s website for info on bus routes now that the new ramps are open. The demolition of the Alaskan Way Viaduct will take about six months. In most places, crews will use impact hammers to break up the viaduct’s roadway deck. Then large hydraulic munchers will remove the viaduct’s girders and columns. In certain locations, crews will cut the viaduct into pieces and remove them by crane. The rubble will be hauled away by truck. Demolition has started in two locations: at the Columbia St on-ramp, and at a section of the viaduct near Pike Street. Soon a third crew will begin work at the viaduct’s north end near the intersection of Western Avenue and Bell Street. The demolition will occur in sections similar to what you see in the image above, with the contractor working on the viaduct in multiple places at once to speed up the overall pace of work. Crews will generally spend around 30 days working in each area. 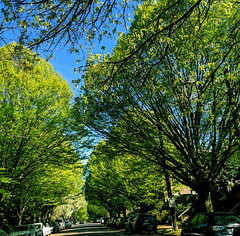 Dive in deeper into WSDOT’s demo plan. Wondering what’s happening at Columbia Street? Can’t wait to know when work starts on Union and University streets? Us too– that’s why we’re keeping a close eye on WSDOT’s interactive web tracker of the viaduct demolition. 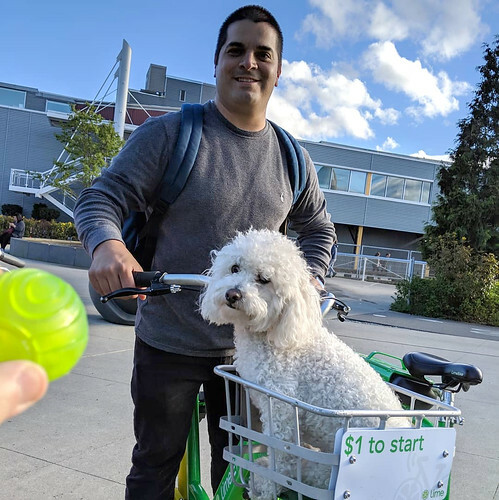 YES – you can still walk | bike | drive on Alaskan Way. Photo by WSDOT. Just west of Pike Place Market, demolition is underway on the old southbound lanes of the Alaskan Way Viaduct. Alaskan Way will remain open throughout demolition. Important to know though, Alaskan Way will be reduced to one lane in each direction in areas that are directly adjacent to the work zone. While Alaskan Way running north and south will be open during the demolition, closures of streets that intersect with Alaskan Way (think: Seneca St, Marion St, and others) will be minimized as well, to keep east-west access between the waterfront and downtown open. 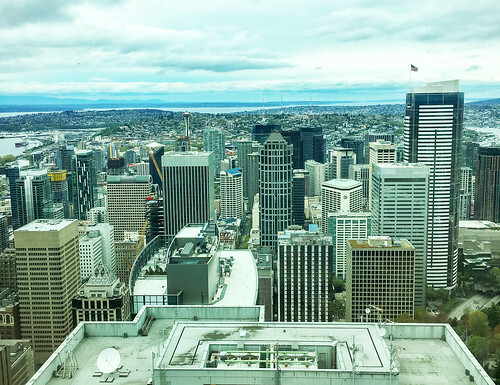 The waterfront, Pike Place Market, and Pioneer Square will all be open for business throughout demolition and will provide good vantage points for watching this historic transformation unfold. Use the FREE Waterfront Shuttle. We encourage you to continue to shop, play, and stay downtown during the Squeeze! Use the free Waterfront Shuttle that runs between the downtown waterfront and three nearby neighborhoods (Seattle Center, Pioneer Square, and the Central Business District). The shuttle program, extended through summer 2019, is paid for with WSDOT funding set aside to help neighborhoods most affected by the project. Information about nearby parking is available at downtownseattleparking.com. 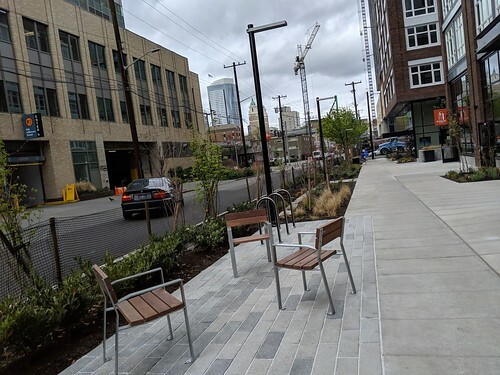 Once WSDOT completes the demolition and the removal of the viaduct, we’ll begin work on a new Alaskan Way street and a public open space along the waterfront. The future of the Waterfront is bright, and we can’t wait until we’re able to experience it to the fullest. In our next blog post, we’ll share more on what’s happening next beyond the viaduct demo and what we’re doing to help the city (YOU!) get through the #SeattleSqueeze. 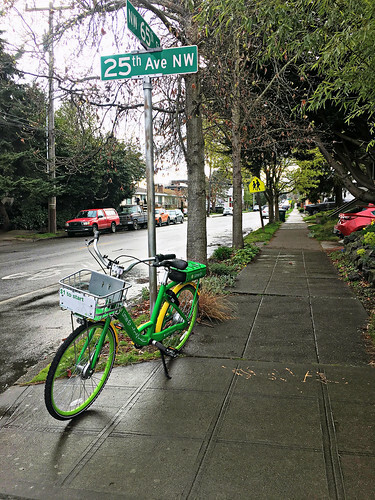 Keep up with all things #SeattleSqueeze on our website.